Last week The Economist had an interesting article referencing Constitute, a project (and pretty slick web application) that aims to provide the world’s constitutions for people to read, search, and compare. At the most basic level, the site breaks down 189 national constitutions into common topics, themes, and provisions for easy comparison of the most powerful governing documents across the world. It also ranks the constitutions by overall scope, executive power, legislative power, and judicial independence. 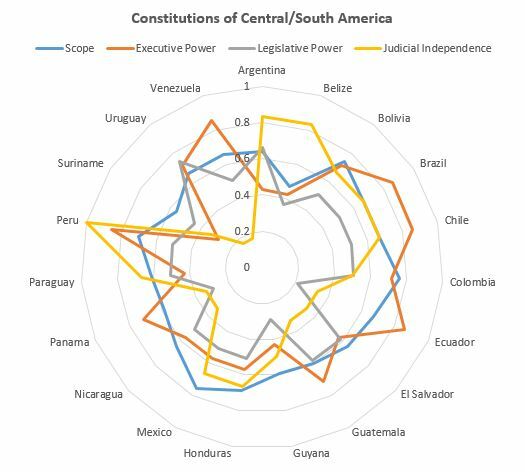 Below is a quick graphic comparing the constitutions of 19 countries in Central and South America. Every year around 5 new constitutions are written and between 30-40 constitutions are amended or revised. Since 1789, more than 900 constitutions have been written. Only about half of all written constitutions last more than 19 years (this was predicted by Thomas Jefferson in 1789 that a constitution “naturally expires at the end of 19 years”). The longest constitution is India’s at over 146,000 words (117,000+ using English-language translation). The shortest is Jordan’s at 2,270 words using the English-language translation. The U.S. Constitution has 4,543 words (original, unamended) and 7,762 (full text). The oldest written set of documents still governing a sovereign nation is San Marino’s “Leges Statutae Republicae Sancti Marini”, written in 1600. The oldest surviving one-document constitutional text governing a sovereign nation is widely considered to be the U.S. Constitution, written in 1789.